While New York City has the largest transit ridership in the U.S., it also has the slowest buses. With the number of residents, workers and tourists at record levels, average bus speeds can be less than 4 mph in some congested areas of the city. This is just slightly faster than the typical speed of pedestrians. As a result, bus ridership is dropping while mobility needs are growing. To expedite its buses, the New York City Department of Transportation (NYCDOT) and Metropolitan Transportation Authority (MTA) New York City Transit have been working together since 2012 to provide widespread implementation of transit-signal priority (TSP). TSP is a significant element of bus rapid transit (BRT) that enables buses to travel faster by adjusting traffic signals along their route in real time to minimize delay. As a bus approaches an intersection, it issues a request for the traffic signal to provide a green light. To implement this system, NYCDOT is responsible for the traffic management center (TMC), roadways and traffic signals, while the MTA is responsible for bus on-board TSP components and their communications. New York’s implementation has been designed to ultimately provide TSP citywide. By early 2018 TSP will be operational at approximately 500 intersections along 10 different bus routes on major congested corridors in all five boroughs of New York. Together these corridors serve over 300,000 riders each day and include high and moderate urban density as well as suburban-like conditions. Plans call for coverage at 1,000 intersections serving 20 bus routes by 2020. Despite this scale, New York is exceptionally well positioned for citywide TSP as the result of its long-term infrastructure investments in wireless communications and TSP-capable advanced solid-state traffic controllers (ASTC) at almost every signalized intersection. Its government-dedicated secure broadband wireless network, known as NYCWiN, supports public safety and other essential city operations and can wirelessly transmit TSP requests to ASTC controllers anywhere in the city. Thus, no new equipment or hardware is required for the city’s vast signal system to implement TSP. The MTA also has developed a cost-effective approach to equip its entire fleet of buses to initiate TSP requests. This approach takes advantage of existing GPS equipment on all MTA buses as part of their vehicle location system to provide bus arrival and travel time information. 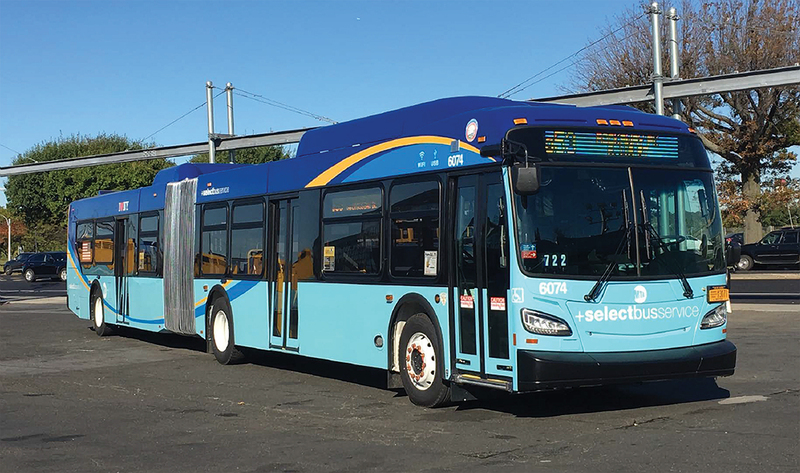 Although some additional hardware and/or software is required to support TSP, the additional investment per bus is relatively modest, allowing the MTA to make all of its buses TSP-capable over the next several years. Thus, New York is in the enviable and unusual situation where infrastructure for TSP is almost completely in place citywide. This infrastructure works together as follows: GPS in-vehicle tracking and on-bus TSP software detect an approaching bus and issue a TSP request to the TMC in Queens, relayed through the MTA’s Bus Command Center. The TMC uses NYCWiN to wirelessly transmit the request to the appropriate traffic signal. The signal’s ASTC controller can then assist the bus by either extending a current green signal, curtailing a current red signal to return the green early, or provide an advanced green signal that allows buses to jump ahead of a queue. The MTA handles bus on-board TSP components. The principal issue for citywide TSP in New York is not the infrastructure. Rather, it is solving a complex traffic engineering problem. Imagine the potential for complete traffic chaos if 5,700 buses request simultaneous adjustments at thousands of signals throughout the city to expedite buses. How and when should each signal respond? The NYCDOT was acutely aware of these issues from the outset and recognized their importance when even an initial few intersections are implemented. NYCDOT selected Greenman-Pedersen Inc. (GPI) as the traffic engineering consultant to assist in addressing these questions. Also under separate contracts with the NYCDOT are TransCore and Peek Traffic. TransCore developed the TMC systems to support TSP field operations while Peek Traffic provided the software to implement TSP at each intersection via their ASTC controllers. The MTA contracted with Global Traffic Technology (GTT) for on-board bus systems to generate TSP requests. 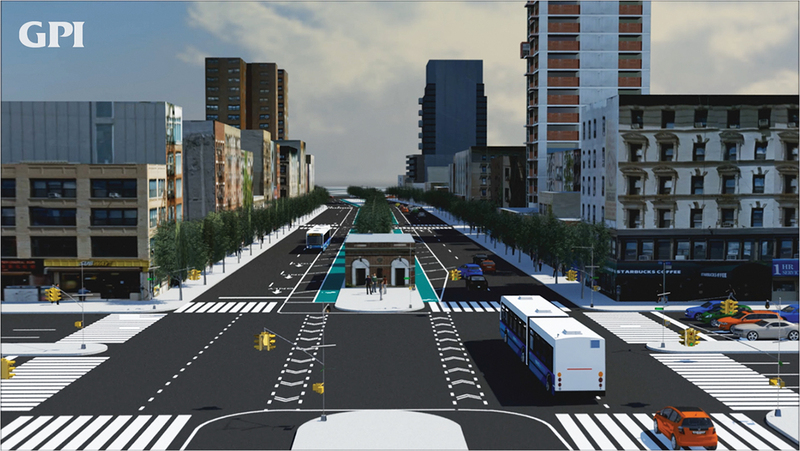 To resolve the traffic engineering questions, the NYCDOT requires a thorough analysis of traffic operations at each intersection on major BRT corridors. Existing bottlenecks are identified and low-cost solutions formulated and implemented to improve operations for all traffic. These solutions may include lane re-striping, parking restrictions and bus station placement. In addition, optimal background signal timings and coordination plans are determined to benefit all traffic and facilitate TSP during cycles when needed. These improvements are known as “passive” TSP, since they provide the foundation for TSP success without real-time TSP signal adjustments. Experience has shown that these improvements often double or even triple the benefits of the TSP implementation relative to simply overlaying TSP on pre-existing conditions. This process utilizes a combination of Trafficware’s Synchro software and traffic engineering experience and judgment. While Synchro optimizes signal timings for all traffic, it does not consider TSP. Therefore, software timings are carefully reviewed and manually adjusted to balance the goals of maximizing TSP benefits to buses and minimizing adverse impacts to cross streets. 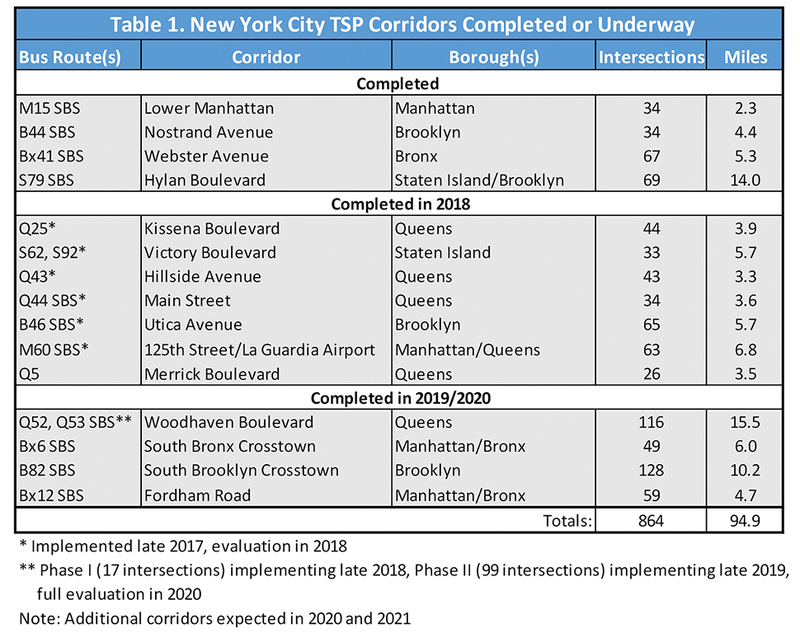 The table outlines completed or underway TSP corridors in NYC. Which intersections can successfully provide TSP benefits to buses without impacting pedestrian safety and unduly disrupting cross-street traffic? Which signal phases should be adjusted at these intersections? How long can these phases be extended or shortened? How should the system handle conflicting calls for TSP service? The answers to these questions are specific to each intersection, since signal timings, corridor and side-street traffic volumes vary by intersection. They also vary by time of day, since traffic and pedestrian volumes, as well as signal phasing and timing plans, are time-dependent. They may even vary by intersection approach, since buses traveling in one direction may be slower than those in the opposite direction (due to right turners, heavier volumes, etc.). To fully benefit from the available time to extend the green at a given intersection, buses in the faster direction should place their call farther from the intersection than those in the opposite (slower) direction. These TSP implementation decisions are universal and apply to any corridor anywhere. How they are answered directly determines the level of benefits provided to buses and the resulting impacts to cross streets. 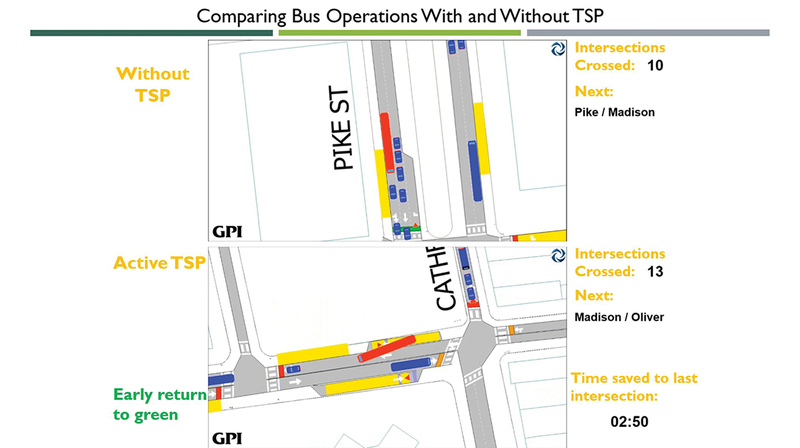 The graphic compares bus operations with and without TSP. Given the complex systemic effects of these decisions, microscopic traffic simulation analyses are performed for each BRT corridor using Aimsun Next software. A custom version of the software was specifically created to represent New York City policies for TSP, including requirements to maintain signal coordination, delineate traffic queues and process subsequent TSP calls after serving the first call in a cycle. These policies were defined by the NYCDOT and MTA at the outset for citywide implementation. Simulation logic to represent them was developed by GPI and implemented in the software by Aimsun. This software is being used to design and analyze TSP implementations throughout New York. This type of simulation represents all traffic interactions within a corridor. It is thus an efficient technique to examine and resolve each of the implementation questions to optimize TSP operations. The modeling simultaneously evaluates the benefits of TSP for buses and its impact on other traffic along a corridor and cross streets. Tradeoffs can be assessed and fine-tuned to arrive at optimal TSP settings that provide meaningful benefits to buses without excessive delays on the cross streets. Simulation models of existing conditions are prepared for morning, mid-day and afternoon peak periods. These are calibrated and validated against field observations, and used to develop and evaluate answers to each of the implementation questions. As shown, custom split-screen animation displays are used to closely examine the effectiveness of these recommendations and refine them as needed. These displays simultaneously track and compare the position of buses as they travel along a route both with and without TSP. They identify the travel-time savings due to TSP and the TSP action occurring at each intersection. These drive-through animations are particularly useful to optimize signal progression, maximum phase extensions and starting points for TSP adjustments. The animations are invaluable to identify intersections where TSP is beneficial in one direction but degrades the signal progression for buses in the other. In that case, TSP is recommended only for the appropriate direction. In addition, the simulation model provides tabular traffic performance measures including travel times, delays, queues and air quality. Once the operating decisions are tested and finalized through simulation, they are programmed into the TMC to implement the system. A visual mock-up of an MTA bus route in Manhattan, created by Greenman-Pedersen Inc.
TSP has been applied on several Select Bus Service (SBS) routes across the city. SBS routes provide BRT features such as low-floor, three-door buses and pre-boarding fare payment to expedite passenger entry and exit at bus stops. Some routes also include an exclusive lane for buses. TSP was initiated in 2013 along a 2.2-mile stretch of the M15 SBS route in Lower Manhattan between the Staten Island Ferry Terminal and the intersection of Allen Street and Houston Street. This section includes 34 signalized intersections through the dense Wall Street Financial District, Chinatown and Lower East Side where an exclusive bus lane is not feasible. This is an exceptionally complex and challenging traffic environment characterized by slow-moving buses and heavy cross-street traffic, as well as substantial pedestrians, taxis, bicycles, double-parked cars and unloading trucks. Through judicious optimization of the signal timing on this corridor, delay was not only reduced on the main corridor, but on the side streets as well. Based on the success of this implementation, TSP has been applied and evaluated on three other corridors serving the B44, Bx41 and S79 SBS routes. Travel times were compared before and after TSP was activated on each corridor. SBS features were in place and reflected in both the before and after samples, so the comparisons represent the benefits of TSP only. Travel-time reductions range from 0.7% to 24.8% depending upon direction of travel and time of day. The average savings during the morning and afternoon peak periods is approximately 11%. The NYCDOT and GPI continue to design TSP operations for additional corridors, while the MTA is adding TSP upgrades to all of its buses. At the time of this writing, traffic engineering analyses are underway on 11 more corridors with plans for seven of them to be fully operational and evaluated in 2018. Given its success, TSP is well received in New York City, and there is demand for additional expansion as quickly as possible. In conjunction with the MTA, the NYCDOT is actively planning for the rapid deployment of TSP on numerous new corridors throughout the city. Athanailos is director of signals and street lighting for the New York City Department of Transportation. Yedlin is director of simulation modeling for Greenman-Pedersen Inc.